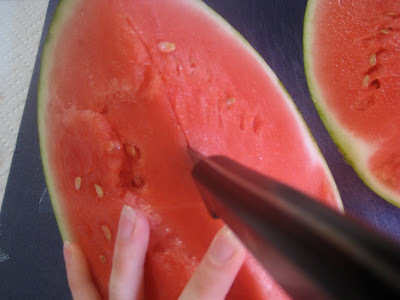 OK, so this tutorial probably won't revolutionize how you view slicing and dicing up delicious fresh fruit... but it will save you quite a bit of time cutting (I'd rather just eat it!) 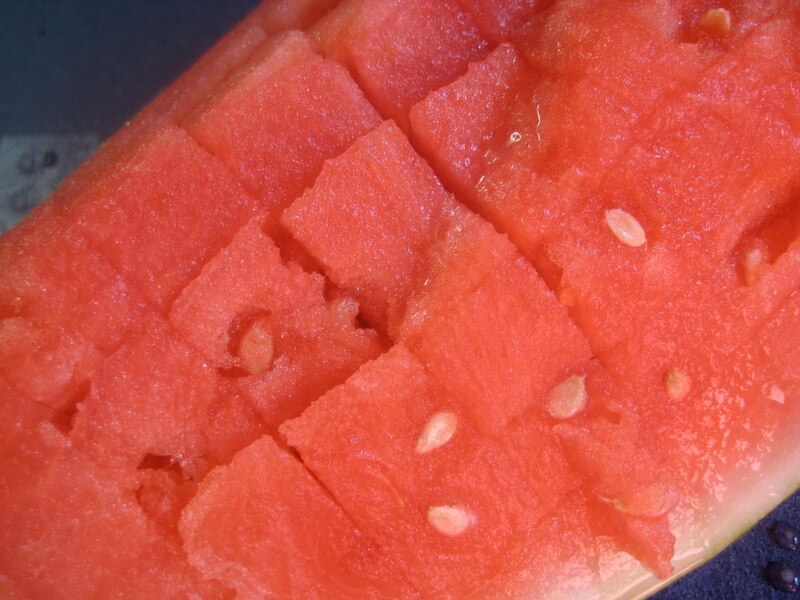 your watermelon- and hey, it may even tempt you to purchase more watermelons this summer! 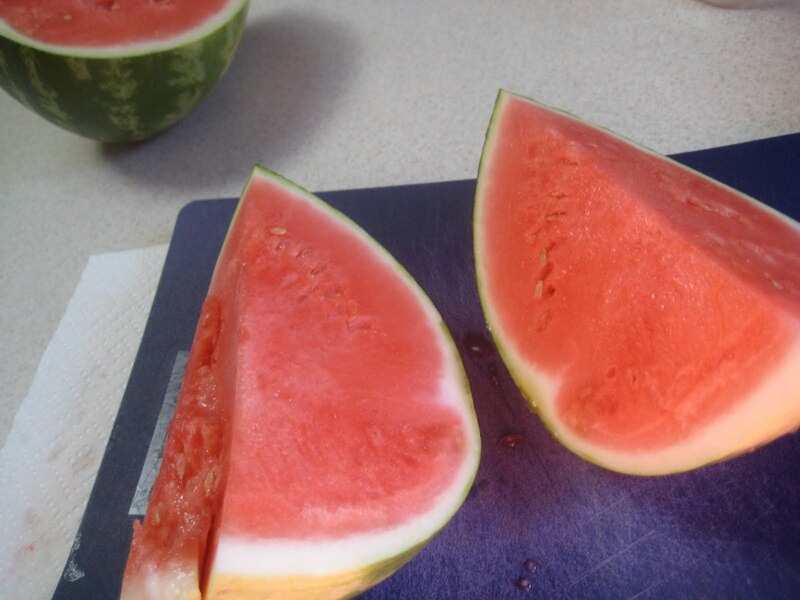 Begin with a well ripened watermelon. Yep, I'm the nerd in the grocery store (get a quick mental image if you must), who knocks on about a dozen watermelons to find the perfect one! (My son, last year- so this year will probably be worse) demanded to get out of the cart seat and help with the knocking... (sure, feel free to conjure up more ridiculous mental images of me and my family!) 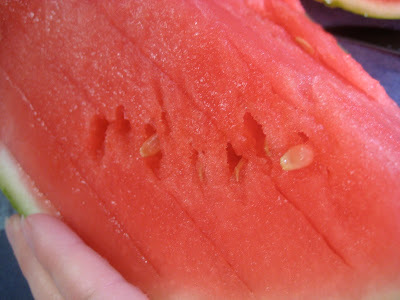 because we are certain that the most hollow sounding melon will taste the most delicious! Go ahead, knock some melons for yourself... wink! I prefer to cut my watermelons using two knives, a large knife for slicing through the rind and a steak type knife for dicing up the flesh. And then continue cutting the melon into 4 quarters. 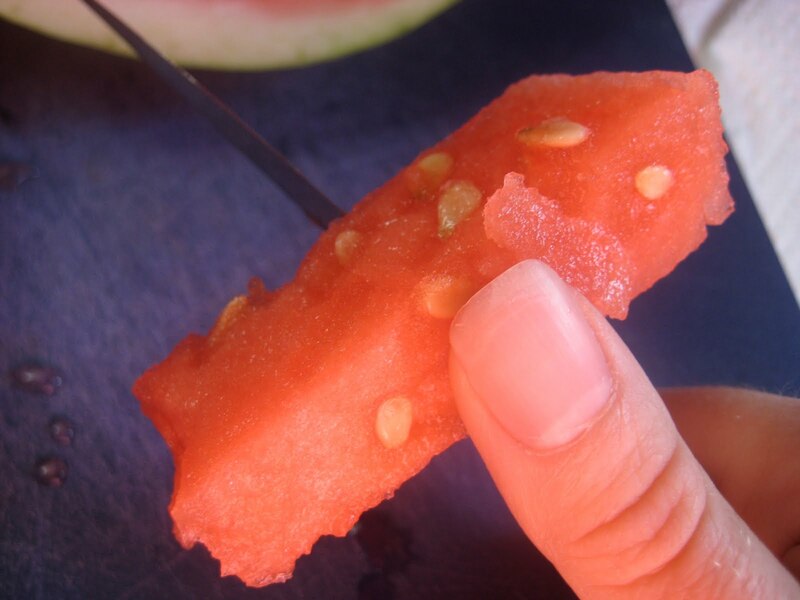 Taking a quarter of the melon at a time, make slices lengthwise along the top ridge of the flesh. Make several rows of slices down each side of the 'ridge,' making sure that your knife is deep enough into the fruit to touch the rind. 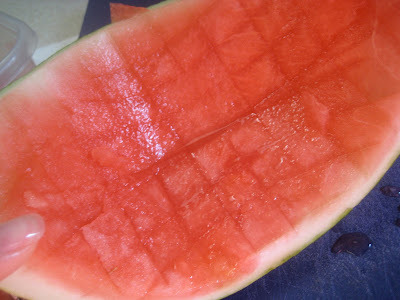 Now, make rows of slices (again, touching the rind with the tip of your knife) in the opposite direction... basically making cute little squares into the flesh of the watermelon. Follow the shape of the rind with your knife, carefully circling the entire quarter of the melon, essentially (and easily!) removing all of the cut pieces from the rind! As if my magic, the delicious watermelon flesh just falls from the rind! 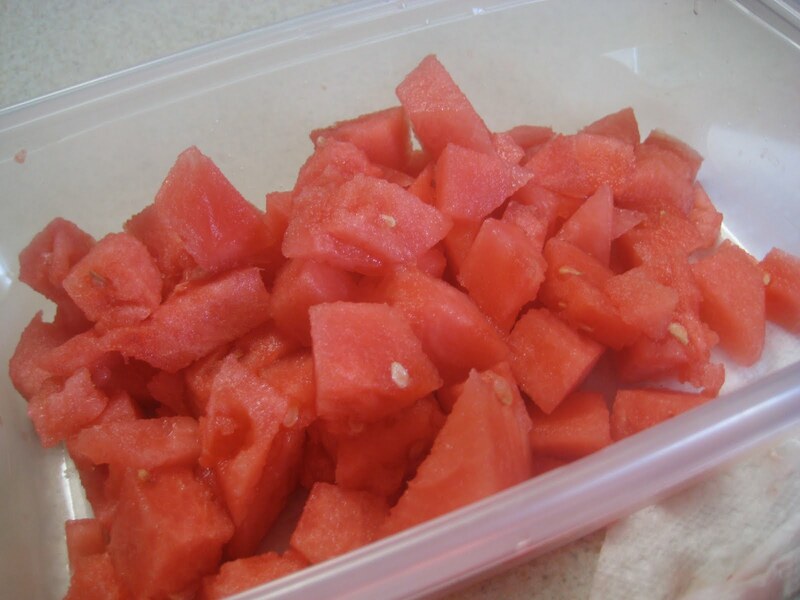 All in all, I'd say it takes 7-10 minutes to go from owning a whole watermelon to completely sliced and diced! Yumm-o! I've never thought of doing it like that!! Thank you for sharing. This will totally cut down on my cutting. Don't forget to wash the outside of your watermelon before cutting. When you slice through the rind it can bring the bacteria and chemicals through all your fruit. I like to cut my watermelon in half and then use an ice cream scoop to scoop out bite size pieces! Guess what I bought this morning. 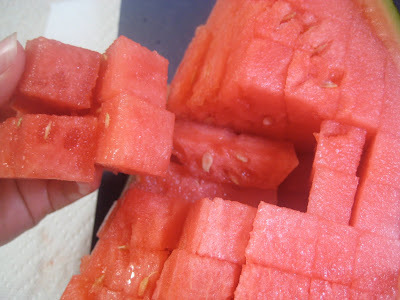 I love watermelon but I hate cutting the darn things. I'll give this method a try today. After cutting in quarters, rather than cutting right down the center (top ridge), I run my knife through so the blade of the knife is perpendicular to the flat surfaces of the melon, starting about 1/2" to 1" down from the top ridge (depending on what size chunks you want), making cuts into both flat surfaces. Then make slices in the opposite direction and slice along the rind like Laura showed. This way you will have all bite-sized chunks without the need for any further dicing. Basically you are making slices in 3 directions, instead of just 2. Does this make any sense?? I totally agree with washing the rind before you dig in!!! 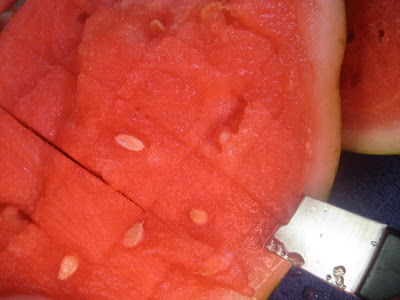 WOW, I had no idea how many great watermelon cutting tips were out there! Thanks for sharing! PS: my son has eaten about 1/4 of the watermelon already! Ooo I love your idea! I never thought of doing it that way. The pictures really helped. Thanks so much.